This week was one filled with knitting and a much anticipated doctor’s visit. Since I finished my socks for Round 2 of Sock Madness, I have been waiting for the teams to fill up so we can get the next pattern for Round 3. 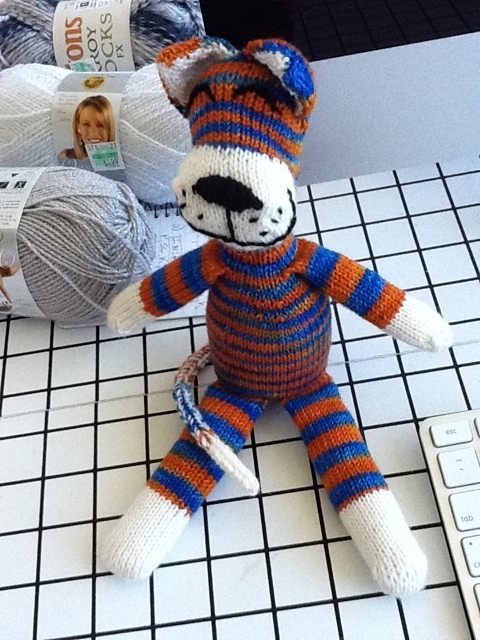 In the meantime, I finished the sock tiger for the baby and started back to work on my Louhi jacket. 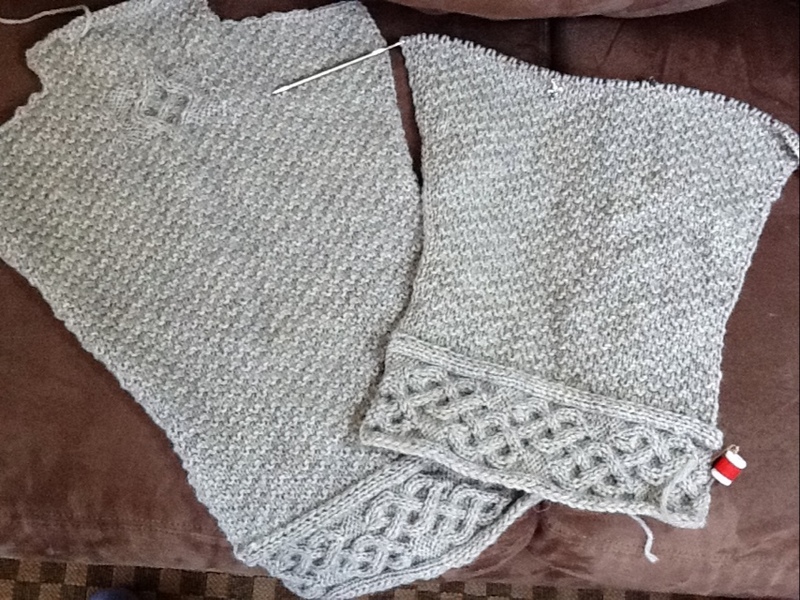 I am almost finished with the second sleeve and it will be a complete coat one day. I figure that if I work on it between other projects, it will finish itself eventually. The doctor’s visit happened on April Fool’s Day. We got up at 3:30 am to drive to Birmingham for a 7:00 am appointment at UAB for a liver biopsy. The first thing they do when you are going to have a procedure like this is blood work to check platelet count, etc. Mine was low. This is normal for me. However, they would not do the procedure until it was raised. So, I got to sit in a hospital bed and receive 2 bags of platelets and at 2:30 pm they finally did the biopsy. It was bizarre and not something I would recommend for fun. I had to be awake for the procedure. They gave me sedation and a local (lidocaine) anesthetic then they went to work. While they were using an ultrasound device to locate the lesion, they would tell me to breathe and hold my breath. Then 3 or more times, they went in with a very long needle and took samples of my liver tissue where the lesions were. The doctor had a very hard time getting to the spot she needed to access and ended up going through my two lower ribs to access the spot. After the procedure, the doctors wanted me to stay for observation for 5 more hours. They were watching for signs of internal bleeding. There was none and Scott and I managed to escape the grasp of the hospital staff about an hour earlier than specified by the doctors. Thank goodness for awesome, intelligent hospital staff that can think outside the box. We made it home by about 10:00 pm and Ebby, Scott, and I collapsed into bed. I am still recovering from the lack of sleep. As a general rule, I am not the most friendly person when I am sleep deprived. Anyway, now we wait. The results should be back next week. However, this place does not work all that fast, so there is no telling when we will hear something. I have high hopes for the grey sweater (it’s going to be wonderful), best wishes for good news, and much gratitude for the quote.